Encouraging indeed.....now: where are the NYC shows? Would have been nice to been informed about this...no email. Anyway, Elvis in a casino = 90 minutes, but YMMV. Arbogast wrote: Encouraging indeed.....now: where are the NYC shows? you know...with three shows scheduled within 125 miles of nyc, maybe not here until the Spring??? Eugene wrote: Would have been nice to been informed about this...no email. Anyway, Elvis in a casino = 90 minutes, but YMMV. i believe this casino is the old TAJ MAHAL! therefore, it would be the same room as the famous HARD ROCK DECADES show, or whatever it was called. Billie Joe, Fiona, Deathcab...great show, WORST SOUND EVER!!! hope that doesn't happen again. anyway, with Asbury ticket in hand a couple nights later, looks like my streak of attending ALL their Atlantic City shows (this will be number SEVEN!) will be broken. unless someone comps me or my cousin. Last edited by bronxapostle on Wed Jul 11, 2018 3:17 pm, edited 1 time in total. Yes, BA, it is the old Taj, with the venue still called the Mark T Etess Arena(named after the Trump official who died in a helicopter crash in 1989), IIRC. Still nothing on social media about this either, nor is it listed on EC's FB page under events. I did buy a pair in section 102 row C, two seats in from the aisle. I cannot not say for certain, but I believe I saw Stevie Nicks in the venue a few years ago, and yes, the sound was awful. It is listed on the EC website, though. johnfoyle wrote: Who's going ? We are...3rd row slightly off center. Will be at this one too! Thanks or the speedy updates Mike, really whets our appetites for a UK tour SOON !!!!!! I count eight songs from the new album and, i think, more last night. question for those in know: is this a lot of new material live from a new album? or to be expected more or less? jardine wrote: I count eight songs from the new album and, i think, more last night. question for those in know: is this a lot of new material live from a new album? or to be expected more or less? I believe as the tour moves on, the number of new songs will diminish, as they figure what works live and what doesn't. The slower songs last night were completely lost as the casino crowd was only there for the "hits". So much talking, taking crappy phones pix and drinking...short attention span theatre indeed. Last night seemed very much on the short side song-wise. Mr. & Mrs. Hush seemed to be an audible. Show started at 8:15ish and wasn't 2 hours by my watch. Not that unusual for EC. The last time I saw him on a proper "album tour" was for SP&S, and he played the entire album except for Changing Partners. What a difference from Bethlehem. Shorter show, different song selection and less vocal reach necessary and we get a show that had all the highlights of the first without the bumps along the way!! Wish I didn’t have to miss asbury park! Enjoy the shows everyone!!! Thanks for the recaps. I'm excited to hear the Look Now songs. 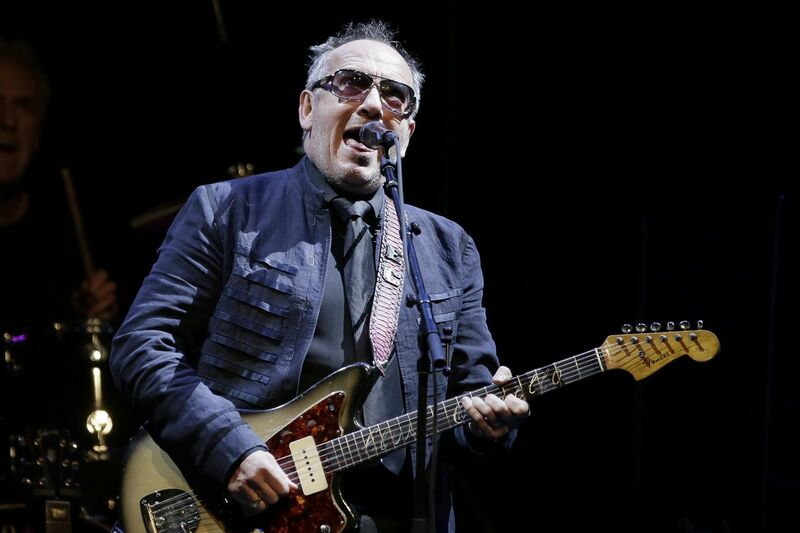 Back in July, when Elvis Costello announced the impending release of Look Now, the new album that's his first in a decade with his longtime band the Imposters, the British songwriter also shared more alarming news. He revealed that he had recently had surgery to remove "a small but very aggressive cancerous malignancy." And though the treatment was successful, he was forced to cancel a series of European shows because the recovery was taking longer than expected. Costello stressed that he'd been exceedingly lucky that his cancer had been caught so early. "You should start playing the Lotto," his doctor told him. 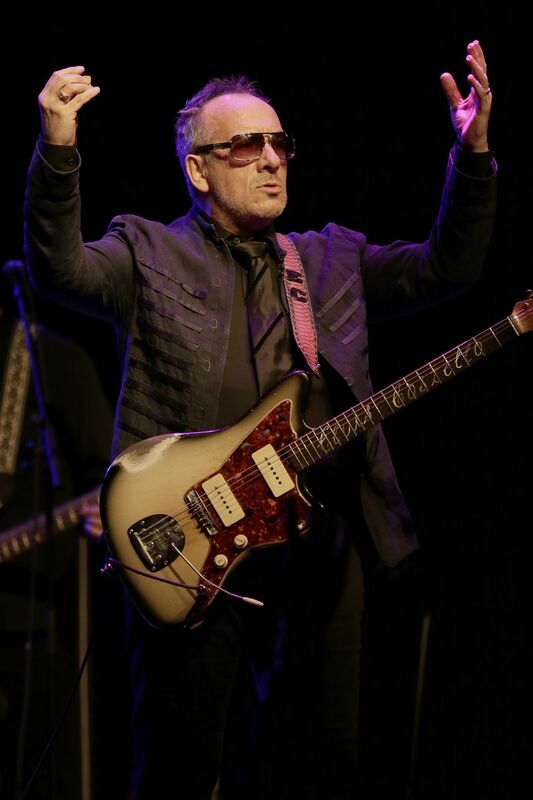 But anxious fans that have been following him since as long ago as 1977 – when the bespectacled angry young man released My Aim Is True, one of the great debuts of all time – were nonetheless filled with "Oh no, not Elvis Costello!" panic. 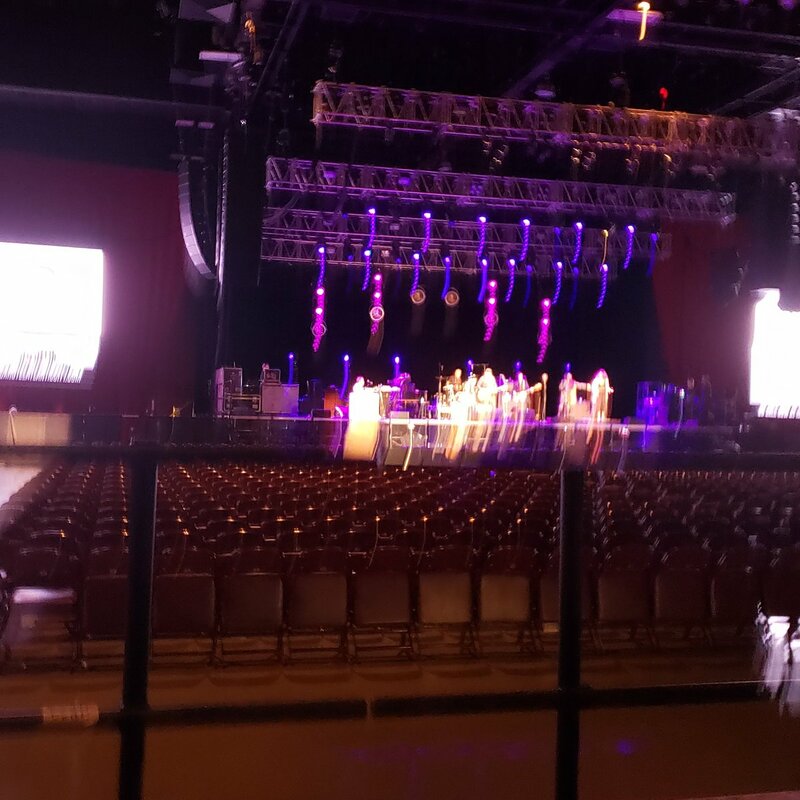 So Saturday night in Atlantic City, where Costello played the Etess Arena at the Hard Rock Hotel in Casino on the second night of the Look Now and Then tour, became a place for nerves to be calmed and sighs of relief to be exhaled. Fronting the current version of the Imposters that now includes back up singers Briana Lee and Kitten Kuroi as well as drummer Pete Thomas, keyboard player Steve Nieve and bassist Davey Faragher, the 64-year-old singer-guitarist looked hale and hearty and was in strong voice throughout. Part of the upgrade has to do with the presence of Lee and Kuroi, formidable vocalists who, along with the also-singing Faragher, collectively ease the burden on Costello to do all the enunciating in his intricately worded songs. The clear highlight of the show came when the two women moved from side stage to center to stand with the front man on a marvelously opened up arrangement of "Alison" on which Costello himself hit a higher note than I can ever recall him reaching, and a buoyant "Everyday I Write the Book" that brought many in the otherwise sedentary crowd, mostly in Costello's age cohort, to their feet. The other energizing effect came the infusion of high quality new material. The historically prolific Costello has slowed the pace of his recording career in recent years, releasing his last previous album, Wise Up Ghost, with the support of Philadelphia hip-hop band The Roots in 2013, and back in the mid-'00s, he was fond of sending out the false alarm in interviews that he might give up making new albums for good. With Look Now, which came out last month, he's clearly put that diffidence behind him and re-engaged with startling positive results, in part through songs that are collaborations with songwriting heroes. 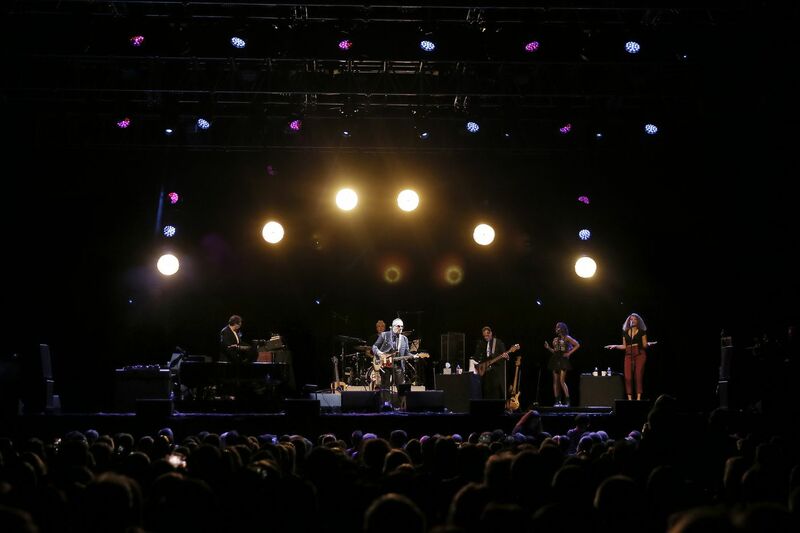 In some cases, he's revived past team ups, as with "Burnt Sugar Is So Bitter," written with Carole King in 1996, and delivered with girl group swagger with the aid of Lee and Kurol at the casino showroom on Saturday. Look Now also includes three new songs written with nonagenarian orchestral master Burt Bacharach, with whom Costello previously worked with on Painted From Memory in 1998. All three, "Don't Look Now," "He's Given Me Things" and "Photographs Can Lie," the latter which included a snippet of Bacharach & Hal David's "The Look of Love," were delivered with delicacy and grace at the Hard Rock. And of course, the show also rocked. The Etess Arena deserves credit for upping the entertainment quotient in always-attempting-a-comeback Atlantic City. But it's hardly an inviting venue: The sight lines are less than ideal in the exceedingly wide rectangular room, and particularly during the first half of Saturday's set the sound was boomy and murky. Thankfully Costello and his long time mates had the muscle to power through and make the most of it. By the time he zeroed in on the gospel-soul self-confrontation "Deep Dark Truthful Mirror," his powerful vocals and Nieve's churchy organ fills were in sync, and the ripping encores of "Pump It Up" and "What's So Funny 'Bout) Peace Love and Understanding" were felt with fully intended impact. sweetest punch wrote: "Photographs Can Lie," the latter which included a snippet of Bacharach & Hal David's "The Look of Love," were delivered with delicacy and grace at the Hard Rock. Anyone know where "Photographs Can Lie" belongs in the setlist?